Are you facing troubles in your life? Do you feel uncertain about a job situation or are you worried that you might lose your home due to the current economic situation? Are you sick or do you have someone in your life who is? Are you parenting a child who is testing you beyond what you think you can bear or who is just plain hard to love? Is your marriage a far cry from what you hoped and dreamed it would be? Do you feel discouraged, tired, hopeless? If you can answer, yes, I know I can, to any of these questions or have a trouble or concern in your life that I didn’t touch on above…where do you turn? Do you turn to a friend? Do you turn inward and shield yourself from the problem or try to “deal” with it yourself? Do you lean on your spouse or are you certain that there is no one in the world to turn to? I am a big do it yourself kind of gal. I see a problem and most of the time I see a solution. If I can’t see a ready solution I take it upon myself to figure one out as quickly as possible. All the while shielding myself from as much pain as I can. I spend a lot of time trying to keep myself in control of all areas of life. Parenting, like most relationship oriented situations, is the surest way to find yourself out of control and that is where I have been over the last 17 months or so. As I mentioned before in another devotion, my husband and I adopted an 11 month old little boy and to say it has been a difficult journey is an understatement. For many of the first months that we were home, I was depressed and discouraged. I couldn’t seem to let go of the pain that E’s rejection brought. And then I got angry. All that pain and disappointment turned to rage, mostly I raged in my heart, but I am ashamed to say that it would at times spill out and it would effect the people around me. I had always felt like a good mom, like I had it together in that area. I took pride in my parenting, but now I just felt like a failure and a mess to boot. I talked to my husband endlessly about it, cried to my mom and dad, and ran it all by my best friends and honestly it did nothing to solve the situation. Sure it felt good to vent, but the darkness in my heart didn’t go away. You see it is so easy to take our hurt and pain to the people around us. To lay our burdens at their feet. To ask for their advice and seek their counsel. While they may listen and give you some good suggestions about what to do in your situation, they are never capable enough to carry your burdens. There is only One who can do that and He is waiting for us to humble ourselves and pray as 2Chronicles 7:14 says, Then if my people who are called by my name will humble themselves and pray and seek my face and turn from their wicked ways, I will hear from heaven and will forgive their sins and heal their land. While I had been praying about this situation, I was missing a key ingredient to standing before my Heavenly Father. I had not humbled myself. Almost every time I took my pain before him, I was still telling Him what I wanted Him to do with it. I would hand over part of my burden while still clutching another ragged corner and I wouldn’t let go. Even in my hurt and pain I still thought that I knew best. I was seeking relief from my pain, my situation. I wanted it to go away, but I wasn’t seeking His face in humility asking Him how he wanted me to walk the road He had put me on. 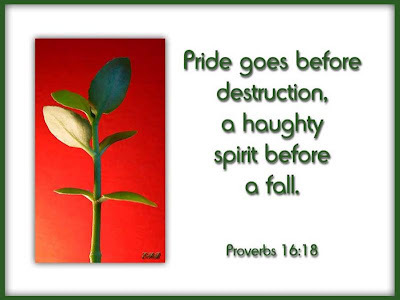 As I learned, pride goes before destruction, and haughtiness before a fall (Proverbs 16:18). And pride ends in humiliation, while humility brings honor (Proverbs 29:23). Coming to the end of my rope was necessary. I needed to get there, frankly need to stay there, so that I could see how little I had to offer my family on my own. I had to come to realize that parenting is something that I absolutely can not do without God. I am not capable nor am I even worthy of the calling, but my Father is and He deeply longs to carry me, burdens and all. He just asks that I admit that I don’t know what to do, that I can’t do it and that I trust Him to work it all for my good. Sometimes the good doesn’t look or feel good. I can attest to that, but in His infinite wisdom He knows what I need. So if you face trials of many kinds (James 1:2), and you will, resist the urge to run to your family or friends…..run, no, sprint into the arms of your Savior (rescuer, deliverer) . Throw your burdens, your pain, your sorrow at Him if you have too. He will catch them. Fall on your face before Him, knowing in that lowly position you are closer to Him than you have ever been. He will hear you and He will answer. 1Peter 5:6-7 So humble yourselves under the mighty power of God, and in his good time he will honor you. Give all your worries and cares to God, for he cares about what happens to you. Sisters, He cares for you and He is mighty to save. Zephaniah 3:17 The Lord your God is with you, he is mighty to save. He will take great delight in you, he will quiet you with his love, he will rejoice over you with singing. You can not save yourself. So don’t try, just give up…hand it over and live in joy.